Although I will have a white linen sportcoat in the car, I may just opt not to wear it today. New linen/cotton trousers, spectator loafers, cotton shirt, cotton tie. For today’s temperatures, consider this “smart” casual. Big fan of the no belt required look. Great outfit. Mr. Venti has veered completely away from pleats, but you pull them off with such aplomb I may have to add a few pairs of pleated trousers to the mix for him. Good inspiration! One of my favorite looks on a man! The white linen sport coat would be a lovely addition. A Cuff Link Shirt rolled up? How easy and elegant. Hello Ms. Durbin, the key to pleated trousers lies in the correct proportion. These are purposefully not of the billowing variety. CG, thanks! It’s a good camera angle as I am carrying at least 6 pounds over my fighting weight. 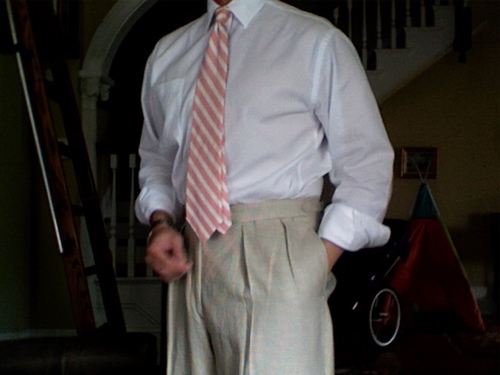 That and a good tailor… the trousers are MTM, linen and cotton houndstooth check with side tabs, forward pleats, a watch pocket (for my pocket knife) and 1 3/4″ cuffs. Hello Pamela, thank you. I did wear the sportcoat to the museum. It was a delightfully breezy and temperate day in Washington D.C. yesterday. Homer, actually barrel cuffs on that one. Just a very full cut in an open weave to better let the air through. And I have pins for wrists. But, I do love to wear my double cuffs that way, too. Especially if they are they only pressed shirts in the closet. Thank you katiedid. I think I’m getting the hang of summer, just barely. In teh 80’s (ºF) and no humidity to speak of helps a bunch. Wonderful trousers. The linen and cotton houndstooth check, sounds perfect for an elegant summer look. And a good tailor is de rigueur to impeccable dressing, even when it’s casual. Hello Breathing, Thanks. I was a bit nervous when I had them made up, especially with my preference for flat-front casual trousers. But they come out beautifully and are a delight to wear. Especially if there is any sort of distance travel involved. That’s where the pleats and no need for belt come into their own. What about the face? Isn’t that what the outfit should lead the eye to, and the most important part? Of course I respect any desire for anonymity, but I would like to see how your outfits work with the colours of your face.